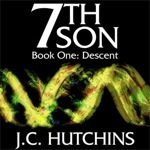 7th Son was the chart-topping, genre-blurring audiobook thriller trilogy by J.C. Hutchins. Called “the best thriller you’ve never read,” the series is renowned for its plot twists, everyman characters and cliffhangers. During its original run, the trilogy entertained more than 50,000 listeners worldwide, and its author has been featured in The New York Times, The Washington Post and on the cover of Blogger & Podcaster magazine. Evocative, action-packed, and brimming with conspiracies and mindbending technologies, 7th Son has made an indelible impact in online fiction. Positively reviewed by filmmakers, A-list bloggers, novelists and countless readers, 7th Son is widely considered one of the “must-listen” audiobooks in podcasting. You may manually download the trilogy's episodes below by right-clicking the episode names and saving the linked files. The U.S. president is murdered by an unlikely assassin. Some time later, seven men -- named John, Michael, Kilroy2.0, Jonathan, Fr. Thomas, Dr. Mike and Jack -- are kidnapped. John, one of the seven abductees, awakens in a government facility, and is locked in a large room. Soon, six other men arrive. None of these men have ever met ... but they share an uncanny resemblance to someone John knows very well. The men meet Dr. Kleinman and Gen. Hill, overseers of the facility. The truth is revealed, and the seven strangers' lives are forever altered. John, Jack and Micheal share childhood stories, to confirm Dr. Kleinman's news. The other three clones puzzle over recent events on their own. The walls begin to whisper. Fr. Thomas has a dream. Breakfast time. One of the "seven sons" refuses to believe Dr. Kleinman's bombshell. Kleinman begins a tour of the 7th Son facility. The descent begins. The clones visit their birthplace -- The Womb -- and learn its secrets, as well as the theories behind memory recording/installation (MemR/I) technology. Dr. Mike and Jack lose their cool. Jonathan loses his lunch. The briefing begins. The clones learn about "Code Phantom." A mysterious stranger interrupts the briefing. More is learned about John Alpha ... and how his plans transcend the assassination of the U.S. president. The briefing in Ops continues. The clones learn more about the early days of Project 7th Son. A secret dangerous technology is revealed, as are the motives for John Alpha's activity. In Washington D.C., Vice President Charles Caine visits a civilian hospital to receive a routine physical examination ... but things do not go as planned. Back at the 7th Son facility, the John, Kilroy2.0 and the others puzzle over the clue John Alpha left for them. The clones begin to work together for the first time. Gen. Hill reveals an unexpected hobby. A breakthrough is made. The clones continue to decipher the Morse Code clue. Dr. Mike takes charge. John Alpha's intentions become more clear. The second half of the clue is decoded. At a military base in the Russian wilderness, a former CIA agent named Doug Devlin reminisces about his past -- and his current alliance with a man the clones know very well. A much larger conspiracy is unveiled. The implications of John Alpha's plans become clearer. The Beta clones finalize the plans for their cross-country trek. Gen. Hill explains the true power of Code Phantom security clearance. The clones call home, to chat with family and lovers. A secret is revealed in Jonathan's life. More mysteries surround Kilroy2.0. Fr. Thomas may be losing his mind. Fr. Thomas and the Mikes head ever westward, to California. Meanwhile back at the 7th Son facility, Jonathan, Jack, Kilroy2.0 and John attempt to understand John Alpha's scheme. A valuable clue is discovered. Research is conducted. Kilroy2.0 finds a moment to shine. The story shifts to Houston, where billionaire oil tycoon A.U. Rookman conducts a videoconference with a business associate. Rookman's legacy of corruption and greed is revealed ... as are details of his ailing health. Michael, Fr. Thomas, Dr. Mike and the 7th Son soldiers reach Los Angeles. Michael briefs his brothers on the plan of attack. After a tense ride through the streets of West Hollywood, the team arrives at Folie a Deux. The mission to stop John Alpha -- and save Dania Sheridan -- begins. At the 7th Son facility, John, Jack and Jonathan learn more about Kilroy2.0's world. A powerful benefactor lends a hand. In California, Michael, Dr. Mike and Fr. Thomas and the 7th Son soldiers invade the night club. They find Folie a Deux silent and empty. Or is it? John travels into the depths of the 7th Son facility for a family reunion ... and encounters an unexpected, familiar face. Kilroy2.0, Jack and Jonathan slip into the CDC's secure intranet, searching for NEPTH-charge victims. In Russia, the Devlins finally begin their first -- and final -- mission together. Kilroy2.0, Jack and Jonathan's search for NEPTH-charge victims leads them to a horrific CDC report that reveals another mystery. John finally meets Hugh Sheridan ... and the true nature of Project 7th Son is unveiled. The story returns to California ... and to the bloodbath at Folie a Deux. The clones learn about Vaporwear. Fr. Thomas and Dr. Mike are captured. John Alpha makes an appearance ... and a speech. Thomas makes a leap of faith. The story returns to the 7th Son facility. Jack, Kilroy2.0 and Jonathan begin to understand that John Alpha's conspiracy is much older -- and more dangerous -- than they could have ever imagined. John continues his conversation with Hugh Sheridan. The genesis of Project 7th Son is finally revealed. The battle concludes at Folie a Duex. John Alpha -- who lives on inside the mind of Vice President Charles Caine -- contacts his other "selves," updating them on his ongoing conspiracy. Father Thomas and Dr. Mike do some soul searching. Dania Sheridan explains the secrets of Psyjack technology. The story shifts to the 7th Son facility. Hugh Sheridan and John explain Psyjack technology to Kilroy2.0, Jack and Jonathan. Dr. Mike makes a call to the facility. The clones, Sheridan, Gen. Hill and Dr. Kleinman discover the scope of John Alpha's recent NEPTH-charge activity. Another secret technology is revealed. The clones are baffled by the ten encrypted messages left by John Alpha's minions. A cipher is found. Hugh Sheridan reveals a secret. Jonathan refuses to help. Father Thomas, Dr. Mike and Dania Sheridan return to the 7th Son facility. The reunion is cut short. In Texas, A.U. Rookman receives a very special delivery. Dania and Dr. Mike chat. Jonathan tells a story. The clones make a major breakthrough. Alpha's trinity is revealed. Alpha's treachery inside the 7th Son facility continues. John, Jack, Kleinman and Hill take an unexpected trip. Kilroy2.0 experiences a role reversal. John, Jack, Hill and Kleinman find themselves in a new predicament. Father Thomas and Dr. Mike console Kilroy2.0. Kilroy, Dr. Mike and Father Thomas learn more about the Russian nuke attack. John, Jack, Dr. Kleinman and Gen. Hill discover more secrets in the Proto-Womb. Kilroy2.0, Father Thomas and Dr. Mike plot their escape from the Common Room. John, Jack, Hill and Kleinman recover from their incident in the Proto-Womb. John Alpha gives an update, and has a conversation with a once-old ally. The repercussions of Alpha's coup in the 7th Son facility become more clear. The Betas talk strategy, and unlock another clue. The Beta clones leave the 7th Son facility to pursue Alpha. Gen. Hill's "very special" aircraft are revealed. A mystery greets Kilroy, Father Thomas and Jack in Texas. John and Dr. Mike land at Arctic Village, Alaska. The clones meet an unlikely ally, learn about a villain's past -- and become one step closer to finding John Alpha. Jack, Father Thomas and Kilroy2.0 solve a riddle ... which sends them to an unexpected locale. A new villain says hello. An ultimatum is made. At Arctic Village, Josephine explains the significance of Brownlow Point and the DEWline. The clones say goodbye ... and learn a secret moments later. In Prophecy, Special(k) makes an ultimatum. Jack plots his escape. Events escalate at Brownlow Point. Jack, Father Thomas and Kilroy2.0 are reunited in Texas. Jack shares his recent revelations. The clones attempt to hail the other Aurora. John makes his way to the Rookman Oil camp, and eavesdrops on several of its denizens. A good Samaritan does a bad thing. Jack, Kilroy and Father Thomas ponder the future. John faces off against four Devlins ... and fights for his life in the Arctic. A recap of events from Books One and Two. John, Father Thomas, Jack and Kilroy2.0 return to the 7th Son facility after their adventures in Alaska. A new technology is introduced. Kilroy2.0 has a breakdown. The clones make a stand. General Hill unlocks the encrypted files in the Ops Center -- and discovers the next ambitious step in John Alpha's conspiracy. The secret of EvacSys is revealed. A Beta Clone volunteers. The secrecy surrounding 7th Son begins to crumble. The charade begins. Father Thomas impersonates Jonathan at the United Nations headquarters. John, Kilroy2.0 and Jack encounter a new ally. Devlins across the U.S. launch John Alpha's final plan. At the U.N., Father Thomas and General Hill scheme. The Beta Clones arrive in downtown Manhattan. U.N. security chief Hannah Vinnj is suspicious of co-worker Jonathan Smith. Major Bennett requests an invitation. A dark discovery is made. At the U.N. headquarters, John, Kilroy2.0 and Jack make an enemy ... and an ally. On EvacSys, Thomas meets the delegates. Thomas and his allies plot an escape from EvacSys. Terror strikes the 7th Son complex. The Beta clones concoct a scheme to rescue General Hill, Dr. Kleinman and the others. Kilroy2.0's secret is revealed. The remaining clones attempt to infiltrate the 7th Son facility. The clones meet their end in the place their lives began. The villains' conspiracy, finally revealed. The Beta Clones make grim conclusions, and scheme. Klaus Bregner's terror begins. John, Kilroy and Jack make their descent into the 7th Son facility. Bregner grows wise ... and vows vengeance. Kilroy has a conversation with himself. The final battle begins. The Beta Clones return to civilian life ... or do they? Kilroy experiences a brief reunion. The Beta Clones debrief. Goodbyes. Conspiracies within conspiracies. The Betas must make a choice. The end of the 7th Son trilogy.